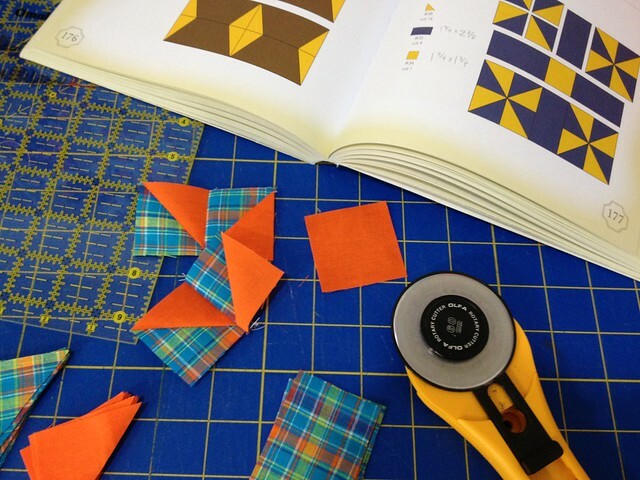 I'm coming to my own conclusion that maybe I actually am The Uptight Quilter. I don't post very often because I hate to post without thinking hard about what I'm going to say and wondering if anyone actually cares and making sure the photos look just so. Well, not today! Welcome to my imprudent post. This post has no forethought whatsoever. Other than the fact that I thought, I should post something and I should take some photos and upload them for the post. Here's what's happening currently in my sewing room. 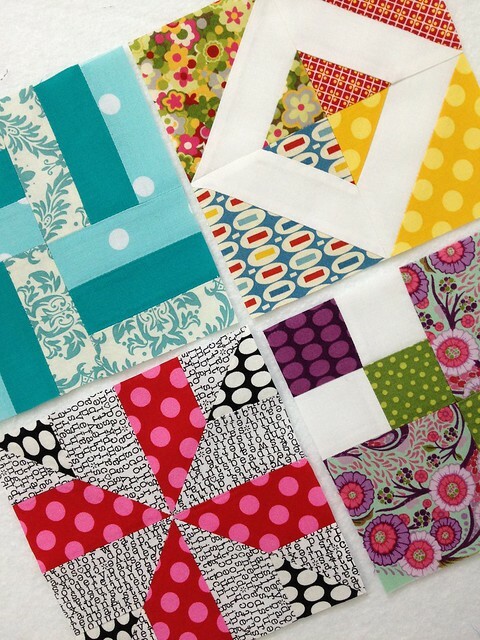 I bought some of each of the 19 new DS Quilts Daisy Mae prints for Joann. They don't feel as nice as the Fairgrounds and Picnic fabrics, but I really like the prints and was able to stack some coupons and get them for 50% off. I think they are worth what I paid for them. I'm not a pre-washer when it comes to quilting (to each his own, don't hate on me), but I think I'm going to pre-wash these to make sure they aren't going to bleed or develop crazy off-grain issues and I want to see how they feel after washing. Has anyone pre-washed their Daisy Mae yet? I worked on a few more Farmers Wife blocks. I'm going the template route, but I've been measuring the templates and just cutting my fabrics to size. I'm making notes in the book and on my templates of the sizes so I can just refer to the sizes and cut. It would seem like their would be more trimming involved, but I trim anyway, so it doesn't seem to be adding any extra time to constructing the blocks. I'm still using the templates for the unusually shaped pieces. Here are the four blocks I did this week. I would tell you their names and numbers, but since no planning went into this post, I didn't take notes and bring them to the computer with me. I think one of them is called Friendship. 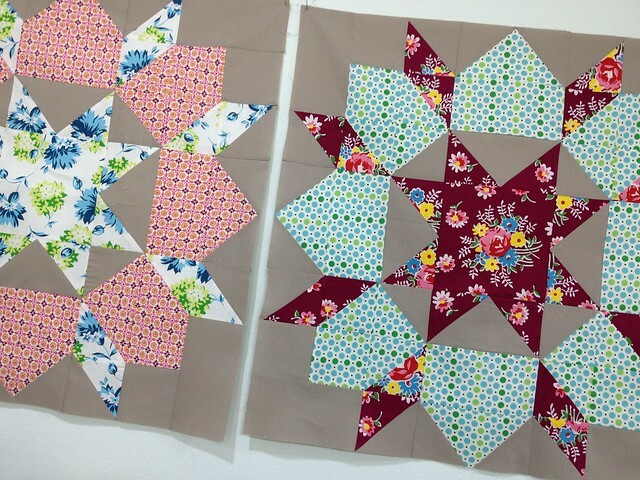 I cut into my DS Quilts Sugar Creek, Picnic, and Fairgrounds and started on a Swoon quilt. I LOVE the huge blocks! into super scrappy x and + blocks. But, I can't decide if I like these blocks. OK, well, that's not completely true, I like the blocks and I love the bright busyness. 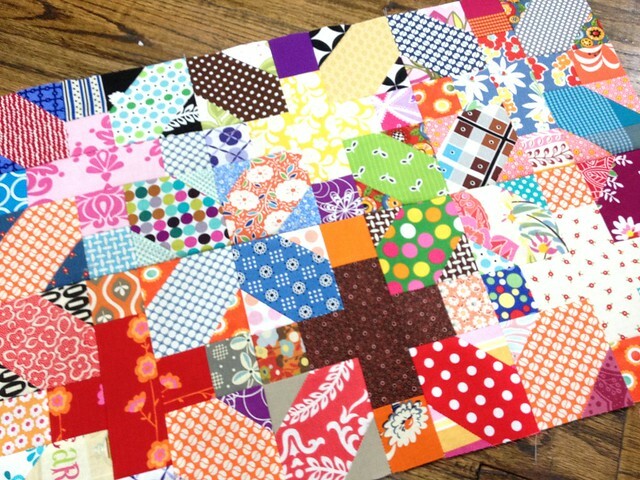 What I'm undecided about is if these blocks break so many rules that people will look at this quilt and think, "Ugh! What a disaster! What a waste of fabric!" I think it's a bit of a hot mess, and I think that's what I like about it! And that's what's happening in my sewing room today. Happy Friday y'all! I for one loved your imprudent post. You have alot of fun (colorful!) projects going on. Love your Swoon (I just finished a super-sized one & posted today, if you are interested.) And really like your x & + blocks. Yes, they are busy, but so cool. I did buy some Daisy Mae too - not all, but my favs (green & light blue). I'm curious what folks say about prewashing it, cuz I'm not a washer either. Everything you're doing looks so scrumptious and fun!!! I really adore the last blocks you showed, if you think it is too much of a hot mess, have you tried placing white (though I would probably choose black) strip between the blocks? I love it!! I like to put all kinds of stuff together and in my opinion, it usually works, so I am a fan of your last photo there. It's busy and crazy but awesome!!! I love your swoon blocks! I really need to get off my bum and get working on one of these for myself...someday! Also, your + and x blocks? Gorgeous! 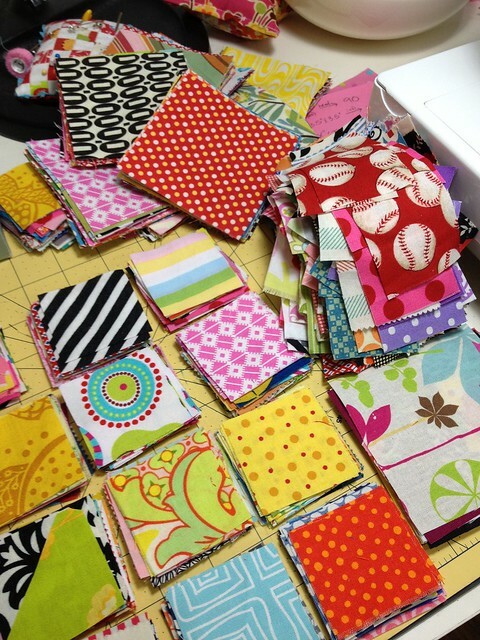 I am a fool for scrappy quilts, so I definitely find it appealing. If you're worried about it being too busy, you could always sash the blocks (or maybe 4 blocks together?) in a neutral to calm them a bit? I hope you love them the way they are, though! Looks like you have a pile of cute projects going. I am interested to see how the pre-wash of the DS fabric goes. I bought some because I love the look but I 100% agree that the fabric is not great quality. I love your Farmer's Wife blocks. They're beautiful! I also really love that Swoon pattern. I keep thinking I should make that quilt. I'm making a Farmer's Wife quilt to go with my grandmother's 1916 diary entries. I love all you work...so pretty and colorful. So...I don't know much about quilting...but I find it beautiful. Since I AM a farmers' wife....what does a farmers' wife block look like? :) Come on over and say hi! I'm an uptight quilter, and I like your hot mess. Can I say shocked that my favorite uptight quilter does not PRE-WASH? You know I love the bright blinding quilts! This looks great! I just love Hello Kitty, I sooo need one of those. Love your post Melanie. I have to admit that I am a bit uptight as well. I generally don't post unless everything is just so (pictures, content, etc.). That mindset often hampers me. Hard to break habits though. I read a fortune (and photographed it to remember later) that said: to think too much about a thing often becomes its undoing. Your projects look great. 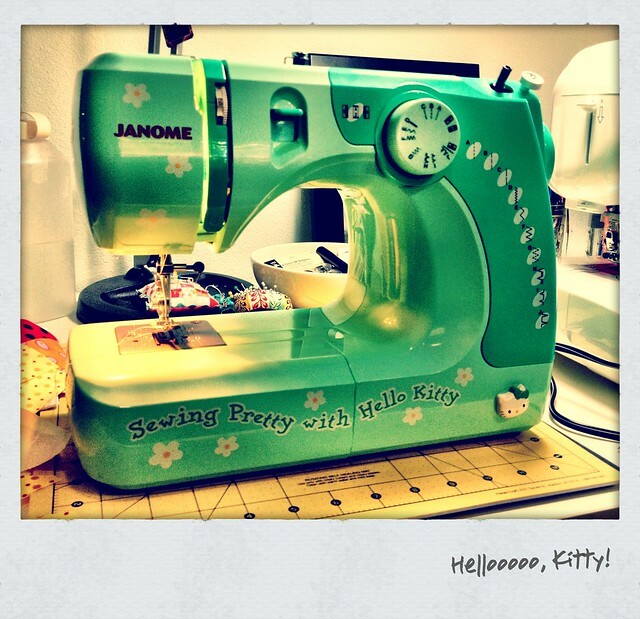 And let me know how HK sews! That last picture is just great! Scrappy and colourful! You go on with your bad self! I love this post and loved seeing what you have been working on while it's still in progress. Keep up the spontaneity! I love the post........good to know I'm not the only one who doesn't pre-wash! I'm only now just stopping by and I did enjoy this post! It's nice to hear what's on someone's mind, even in bits and pieces. I hope you don't mind me saying that I would add a bit more black/white to your last quilt blocks with the X's. I think you're on the right track and that the loud/scrappy look is going to rock. Just a bit more black might show how serious/intentional you are! I'm so excited to see someone else besides me had to have the Hello Kitty baby machine! I just LOVE mine! It's so light and you can set it up practically anywhere! I love all your blocks. They are bright and beautiful! I'd rather see imprudent posts from you and get more of them than prudent ones that don't show up as often! I enjoy your work and find your fabric choices interesting. 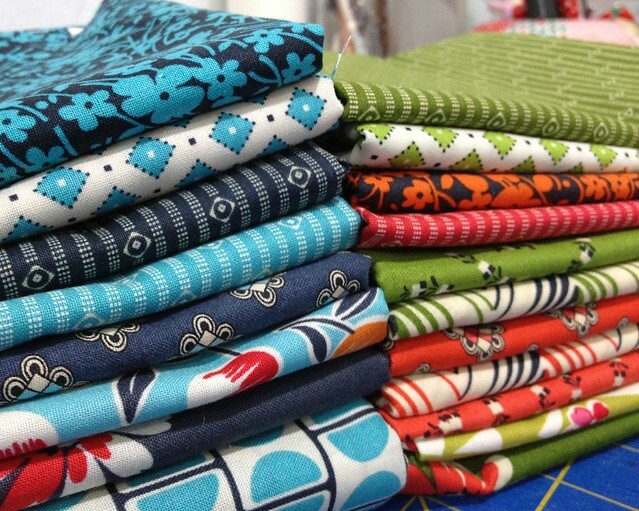 Those fabrics are not readily available near me but every now and then I go into "the city" and I will look for them. As far as the X blocks, lovely. I would like to see them on your design wall with a border of white, cream, green, or brown. Maybe black about half the size of the block and then some sort of border outside that, that brings the scrapiness back to the quilt. The eye can rest on the thick first border and dance again on a second, smaller border. I check with your blog at least once a week and enjoy it so much. Well...you just GO GIRL!! Get DOWN with your OLE BAD SELF!!! I love a blogger who can be rebel!! !